Next time you’re in Las Vegas, you should really think about checking out the sites. No, not the usual sites. Not the Strip or the Hoover dam or wherever else people go when they come to Vegas. Instead, you should think about some Las Vegas attractions in the downtown area. Here are some of our favorite murals in Downtown Las Vegas. We want to highlight some of the most photo-worthy spots in the area. Check out the Downtown Las Vegas attractions you should see. The Fremont East District sign arching over the street is, of course, a photo-worthy spot you shouldn’t miss. If you line up with the rest of the road in the shot, you have an opportunity to capture some other Downtown Las Vegas gems in the photo. Right behind the Fremont East sign are the neon cocktail and the vintage Vegas sign. This area pays homage to old Vegas better than almost anywhere else downtown. Downtown Las Vegas is in the middle of a revival that is deeply rooted in history but has a modern twist. These neon signs are pure vintage. Las Vegas’ oldest casino sits at the corner of Fremont Street and 6th Street in Downtown Las Vegas. The light blue color covering the classic neon signs screams vintage. The photo opportunities are mostly limited to the outside of the building, but if you have a chance, step inside and breathe deeply. The smell of the El Cortez Hotel & Casino is precisely what you would expect from the oldest casino in Vegas…in a good way. Since 2015, couples have been taking photos in front of the Love Forever mural by artist DFace. It has the words “Love Forever” painted in vintage colors and typefaces alongside the large depiction of a woman who is half-decomposed to a skull. It’s creepy. It’s inspiring. It’s something you shouldn’t miss. 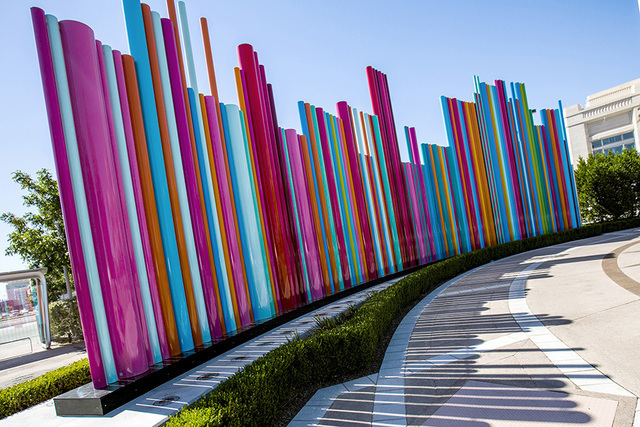 These rainbow-colored tubes shooting out of the ground make the perfect backdrop for any photo. They can also stand alone as the focus of the picture. Take some time and wander around all of Symphony Park while you’re there. Enjoy the rarity that is a large area of grass in the middle of the desert. We are passionate about the spirit that runs through DTLV. Let our guides show you their favorite Las Vegas attractions to drink and hang out. You’ll get the true Fremont Street experience with Vegas Pub Crawler. Book your crawl today to find more hidden gems throughout old Vegas.